In addition to visiting the Uniform Shop and placing an order in person, Matrix Uniforms (supplier of Comet Bay College Uniforms) now offers the convenience of online ordering. We strongly recommend students attend the Uniform Shop prior to purchase to ensure correct sizing. Please be aware that there may be extended wait times during traditionally busy periods (ie. start of the school year). We thank you for your patience and understanding during these times. Please visit the Matrix Uniforms Website for further information. Please note this phone is only operated during school uniform shop hours. If we are unavailable please leave a message and we will call you back. For urgent queries please email sales@matrixuniforms.com.au. Comet Bay College – adjacent to the Auditorium, inside the Science building, access via the Sea Grass Gates. This Uniform and Dress Code applies at all times when students are required to wear their College uniform before, during and after school. The College Board has endorsed a Dress Code for all students attending Comet Bay College. 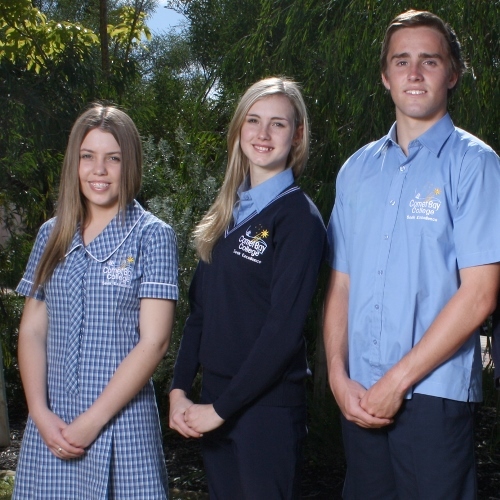 All students and parents have been advised of our College Dress Code and have signed the Uniform Policy Agreement indicating compliance prior to enrolment acceptance. Students are to comply with the Dress Code to be eligible to participate in excursions, camps and extra-curricular activities, including ‘Reward Days’. It is not acceptable for any students not to comply to the College Uniform Policy. Please review our Uniform Policy and Dress Code for further, more detailed information.